From the State of North Dakota Comprehensive Annual Financial Report for fiscal year ending June 30, 2011. As of the close of fiscal year 2011 the State’s governmental funds reported combined ending fund balances of $5 billion, an increase of $1.2 billion. Of this amount, $86 million is non-spendable, primarily for permanent fund principal. Spendable fund balance consists of $2.4 billion restricted for specific purposes such as transportation, $1.7 billion committed and $124 million assigned for specific functional expenditures such as public safety and regulatory, with the unassigned fund balance making up the remaining amount of $709 million. At the end of the fiscal year, unassigned fund balance for the GeneralFund was $712 million. The biennium ended with a General Fund balance of $996.8 million. The unassigned fund balance for the General Fund was $712 million. The actual ending balance of $996.8 million is the highest end-of-biennium balance in North Dakota history, both in nominal terms and as a percent of the appropriated budget. 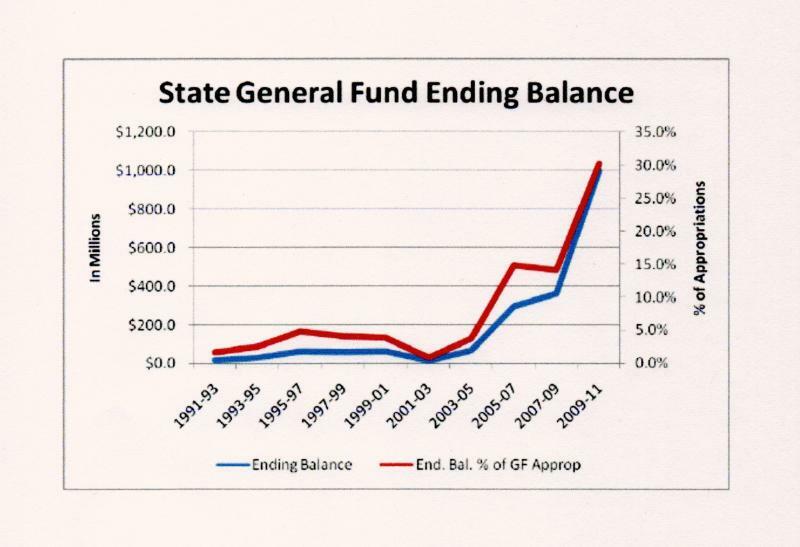 The chart on the previous page shows the history of end-of-biennium general fund balances.